Our SVR Tracking service enables lot owners to locate and recover their vehicles with live, real-time tracking, and provides stop verification, enabling them to determine potential locations for their vehicles. Alerts will flag owners, making them aware of events of interest. 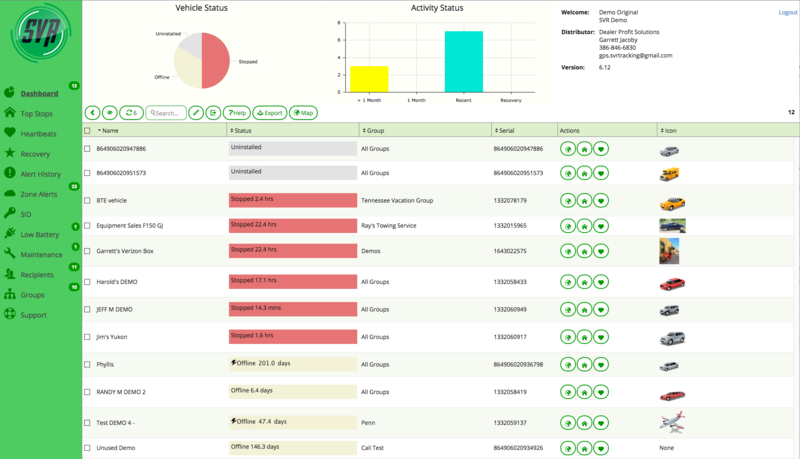 The application dashboard provides real-time graphs and detailed vehicle data suited to tighter control and accurate measurements of vehicle activity. Tracking vehicles has never been so easy! The best way to get help is at support@svrtracking.com � email support is monitored by numerous support staff and is usually the fastest approach. You can also contact your distributor or call SVR Tracking at 619-894-6091, but please take a look at our Frequently Asked Questions, Support tab, for commonly asked questions and answers.